Lovely hydrangea blossoms for your summer and spring garden scenes. These gorgeous blossoms will spark your creativity. 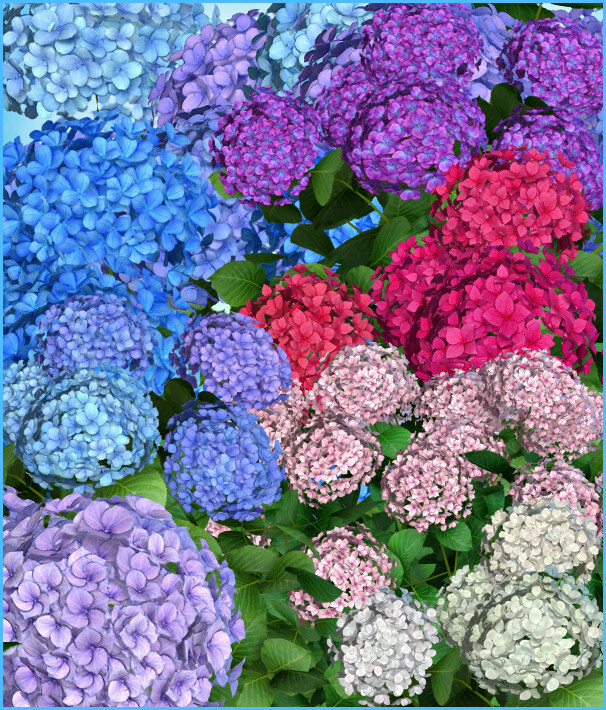 Lovely Hydrangea Garden Graphics–lots of luscious hydrangea blooms for your springtime and summer designs in a burst of dazzling colors, including lavender, pink, blue, and more. These gorgeous blossoms will help you get into a creative mood this season and will be the perfect addition to your garden or outdoor scene. 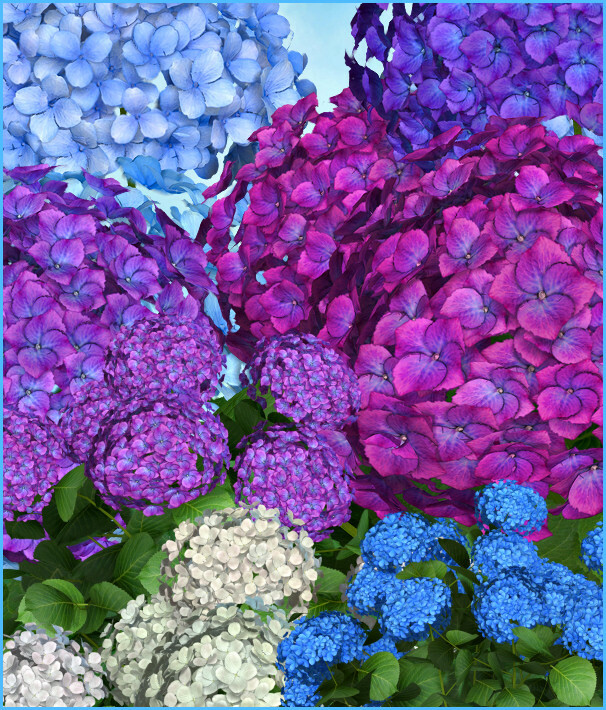 Or simply use these Hydrangea Garden Graphics to lavishly embellish your digital scrapbook, print project, or other designs. The design possibilities are endless. A beautiful hydrangea seamless tile is also included. It’s in the first zip file. You can see it live here. This tile can be used as a texture in Photoshop or Paint Shop Pro. It would make lovely digital scrapbook papers by simply using the flood fill method. You could also use it to fill other scrap book elements to create matching designs. Use it for edging, borders, frames, etc. The size of these images varies, but they are approximately 2000 X 1600 pixels. All are 300 DPI, making them great for print projects. Members can use the tubes for personal and most commercial projects, including web design, template design, graphic design, t-shirt design, candy wrappers, digital scrapbooks, print transfers, DIY crafts, Zazzle projects, Cafe Express items, card making, embroidery designs, fabric blocks, address labels, business cards, newsletters, stationery, invitations, banners, crafts you print, paper projects, digital stamps, notelets, stickers, note cards, sig tags, and much more. Please read my terms to learn more. This package is four zip files, which are approximately 35-76 MB each.